“Though I am the eldest among five daughters at home, my parents rarely ask me to do housework. They instead prefer me to sew Tibetan costumes and that is their only requirement for me,” Zhuoma said. When we reached Zhuoma’s courtyard, which lies in Benzilan Township, Deqin County, Diqing Tibetan Autonomous Prefecture in Yunnan Province, Zhuoma had waited us, in a purple cloth. It was casual, yet interspersed by golden silk, exquisitely. Zhuoma told us that she spent ten years making the first Tibetan costume after she picked up a needle at 15. 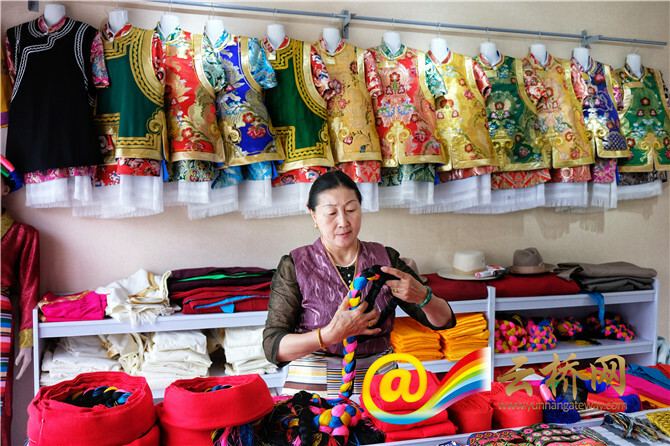 She now, aged 55, has set up her own factory in Tibetan costumes making and the products are popular in local and surrounding areas. She said that she can still feel the joy and sense of achievement in the same way as she did four decades ago, when sitting in front of the sewing machine and seeing the costume gradually take shape. “Traditional Tibetan costumes are all handmade. Crafts of women’s clothes are complicated and styles for the youths, middle-aged and senior people are different. So are materials and decorations on the clothes. Generally, a single costume takes one over ten days to accomplish,” Zhuoma was in a delighted voice, when it comes to Tibetan costumes. 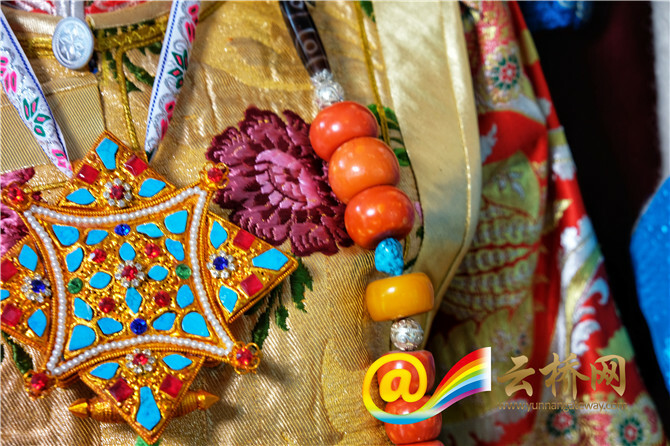 The costumes in Benzilan are colorful and matched delicately. While keeping traditional styles, the hat and the pleated skirt are of local features. Almost everyone needs a costume for events like weddings, funerals, festivals and the Guozhuang dance. Although the costume plays an important role in daily life of Tibetans, it was once on the verge of extinction. Zhuoma said that her father used to be asked to make dancing costumes by local monks. Back then, he was the only craftsman who can make traditional Tibetan costumes. As the eldest in her family, Zhuoma was highly expected to pass down the inheritance. She started learning the craft at the age of 15 from her father, while other sisters would do all the housework so that she could focus on sewing. Attracted by the charm of Tibetan costumes, Zhuoma spent all her time in working place. Years of hard work made her a skillful costume maker. Having learnt all sewing skills from her father, Zhuoma helped her family better off because of the craft. 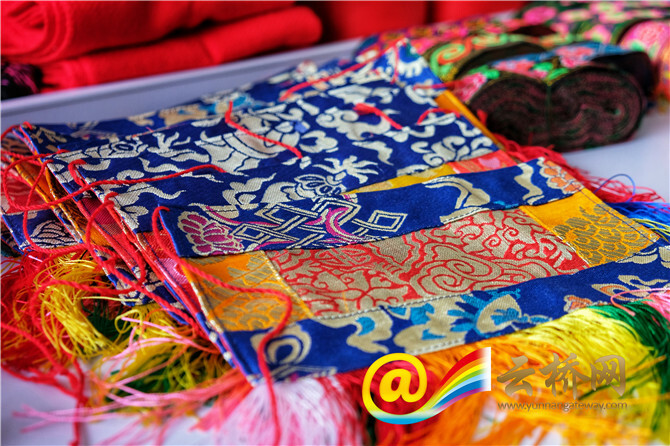 Zhuoma now is the representative inheritor of Tibetan costumes sewing, a provincial intangible cultural heritage. There are 5 sewing machines in the factory and her daughter-in-law also began to learn the skill from her and the products they make are popular. “It is September now but orders before the Chinese New Year are not done yet. Too many!” Zhuoma said in a shy smile. We can make costumes in different styles that fit formal occasions or daily use, and the prices range from thousands to tens of thousands RMB, she told us. Sewn in exquisite workmanship, many of their products are collected by museums. Last year, a local temple asked Zhuoma to make the dancing costumes, just like what had happened to her father. 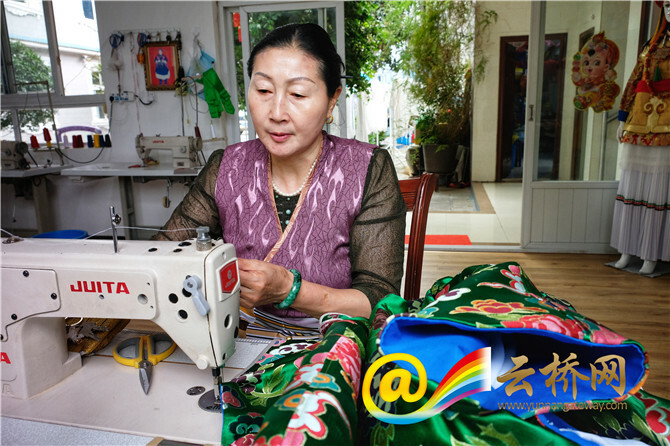 Decades of sewing is an enjoyable journey for Zhuoma, she said proudly and happily. 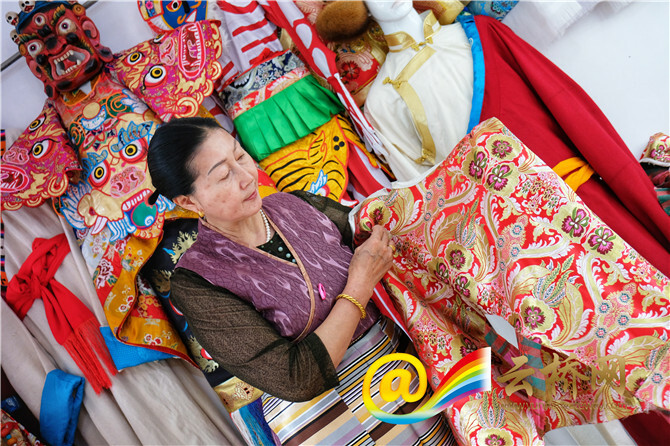 Tibetan costumes making is a lifelong career for her.